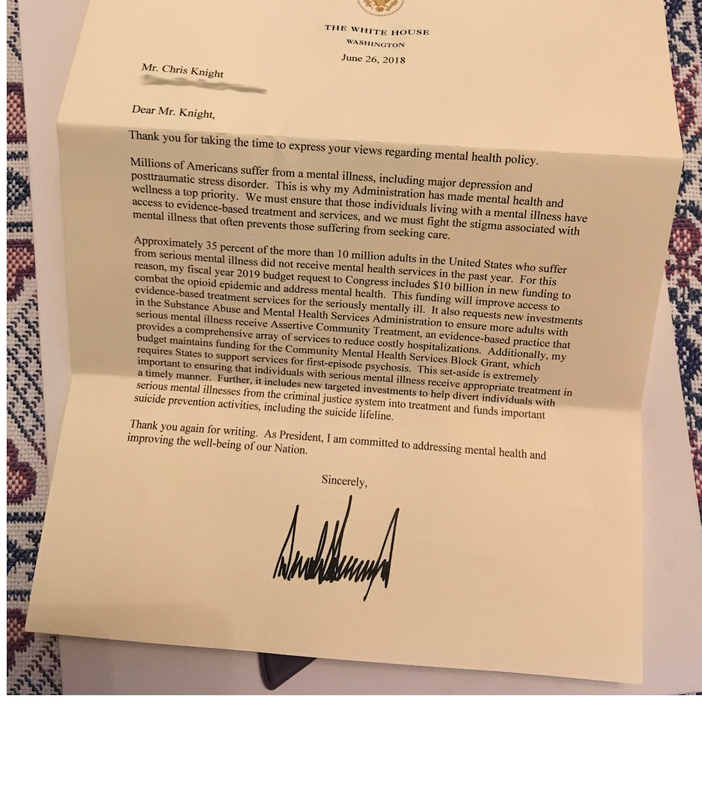 Several months ago, following a mass shooting incident and some remarks he had made about mental illness, I composed a letter to The Honorable Donald J. Trump, President of the United States. In the letter I shared some understanding that I, as a person with bipolar disorder, have come to discover. Namely, that mental illness is a condition of the mind, and not the heart. Over much of the past year especially I have worked alongside many who also have varying types of mental illness. Not one of them is a person I would ever consider to be a danger to others. But I also do realize that there is a stigma, and maybe it will be with us for a long time still. And I suppose there is little that just one guy with a blog can do about that. Even so: bipolar disorder has wrecked havoc with my neurobiology. But it can't touch my soul. That's something still left as a choice to each of us. We decide whether we will take the path of good or bad with each new day. And that is what defines us... and no matter what is beyond our control within our grey matter. 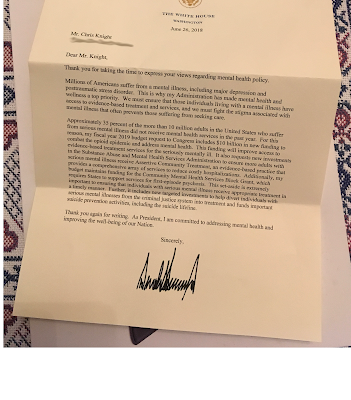 Well, it took awhile for me to receive it - because your Friend and Humble Narrator has been busy with stuff here and yonder - but late in June a letter from President Trump arrived, and in it he addressed many of the matters that I was attempting to bring to his attention. He doesn't touch upon the thoughts I conveyed about mental illness not affecting moral choice, but neither do I get the sense that it was entirely a "form letter" either. Somebody in the White House read it, and sent it to President Trump's desk for his signature. More than likely he has written letters about several issues and the one most appropriate for the situation gets used. Not that I would blame the guy. Nor can I blame him for the late reply. I mean, hey... he's the President of the United States! Dude's got a lot on his plate. But it's still quite nice to get a response with his signature on it. Part of me wondered if I should post this without asking for President Trump's permission first. Then I rembered how busy he is and that it took eight months to get this letter! I'm gonna assume that it's okay with him. Anyhoo, Mr. President, if you're reading this: Thank you. And your concerns and beliefs on the matter are greatly appreciated. Now that's impressive. 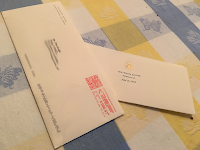 I wrote letters to Obama and to George W. Bush. Obama never wrote back and the responses from Bush were word for word identical, obviously he or anyone else in his office never read mine . Trump's letter is reassuring on many levels. Congratulations on being written to by the forty-fifth President of the United States! it is a form letter. jeez man.